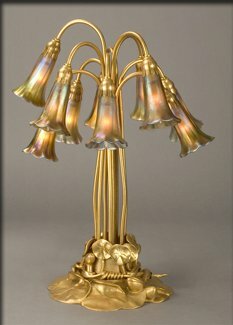 Ten Stem "Lily" shaded table lamp with a "doré" (gold) patina, versus the more typical brown/bronze colored base finish color. While some people favor the more common and traditional brown patina bases, those who like a bright and lavish look often seek the lamps with the doré patina. "Pond Lily" base model #381.